Beach wave hair is the go-to style for every girl. Do you know why? It is because this look is perfect. In this article, we will be sharing some really awesome and cool beachy hair wave ideas with you. If you are one of those few who wants to look perfect even on a beach holiday, make sure that you go through this article completely. It is time to put all your hair down and let it flow like a wave. This type of hairstyle can look good on anyone with slightly long hair. When it comes to a list of beach hairstyles, this is known to be one of the best beach hairstyles and preferred by our celebrities also. If you are planning for a long holiday or if it is a photo shoot at a secluded place, this hairstyle is on point. This is a very casual hairstyle, makes one look confident and cool, both at the same time. This hairstyle can be easily achieved with the help of a curler, or one can simply use a wet hair braid to get the perfect look. This simple hairstyle, paired with a casual outfit is ideal for that peaceful evening. This hairstyle is a perfect combination of waves and curls. If you have straight hair and want to experiment with your look, this hairstyle has to be on your list. If you are planning to get up in the morning and head out, this hairstyle is perfect for you. All you have to do is set the curls at night, and you are good to go the next morning. While this hairstyle might let others believe that you spent your entire morning doing the curls, on the other hand, all you have done is just spent your time sleeping through it. Just use some good quality spray to make sure that you have kept your short hair in place. As your hair is short, so there is a high chance that your manes will be all over your face on the beach. The best part about this hairstyle is that it can easily be tied as per your wish. This casual hairstyle looks perfect with a loose and bright t-shirt. This is a very common hairstyle if you have short hair. If your hair has even a slightest of wave, then this hairstyle is perfect for you as this works best with natural waves in the hair. In case you have straight hair, still you can get this look. All you have to do is use a curling iron and curl the hair, but not the ends. Tousle your hair and you are good to go. For a naturally long and wavy hair, this is the perfect hairstyle. As beaches are humid, the humidity does its trick by bringing the natural wave and curl. You just have to scrunch your hair as soon as you wash your hair and apply a hair gel and you are ready for the party. If your idea is to just sit by the beach and enjoy your time and not get wet, this would be your ideal hairstyle. This is quite an elegant look and will make you look confident and charming. If the volume of your hair is really thick, you should definitely go for this hairstyle. You will for sure fall in love with this hairstyle as it will make you look casual and chic on another level itself. This is actually an easy beach hairstyle if you compare it with the others. It is a perfect combination of slightly straight hair and curls. This hairstyle is very easy to achieve, all you need is a pencil knot. It is one of the easiest and the most simplest hairstyle for girls across all age groups. The middle part is the best part about the beach. It is an easiest hairstyle that one can have. All you need to do is part your hair in the middle and spray some gel, and your hair will look like that you have a lot of volume even if it does not. Create this beautiful look by letting your hair loose a bit. Start by dividing your hair into three partitions. Take a small portion of your hair in the left and right, and keep a small portion at the back. To get this look, you really do not need to put much effort. You can create this look easily with the help of a comb and a styling gel. This is a fun and chic style which is in vogue these days. This look makes your hair look overall fluffy. And to make sure that happens, you have to follow one simple trick, curl your hair as you would want it to, and then brush out your hair. Once this is done, you can add spray to give your hair a bit of texture. This tousled kind of waves is perfect for any of the concert that you intend to attend by the side of the beach. At the end of the day, you can always tie up your hair in a bun and use some hair spray to keep your hair intact. These beautiful curls will give a slight feminine vibe, no matter what color the hair is. Start with one session of blow dry, post which you should use a curling iron only on the ends of your hair. Don’t we all envy this volumized wavy hairstyle? You can get this hairstyle by blowing out your hair with the help of a round brush, spreading them towards the side and adding curls towards the end to give that final look. If you are a die-hard fan of ringlet curls, this one is undoubtedly for you. To get this look, all you have to do is use a curling iron and curl all your locks, and brush later as soon as it is done. One crucial thing to be kept in mind is that you should brush your hair while it is hot to get those curls. This is a very simple look. And the best part about this look is that you can pull this one very easily. To get this look, your hair should neither be completely wet nor should be completely dry. It should be somewhere between about to dry look. Use some hair gel while your hair is about to dry and add some gloss to keep your hair intact. This look was very common in the 70’s. Part your hair in the middle and with the help of straightener you have to make sure that you keep your hair away from your face. Start with your ears and move down. Doing this will add subtle waves to your hair. This look is also known as “I woke up like this look”. To get this look, you will require a massive round brush and a blow dryer. While using the blow dryer, use the round brush with very light strokes, rotate the brush lightly and once this is done you can use your fingers to finish the look. Do you have the habit of keeping your hair to one side always? If yes, then you will surely love this side wave hairstyle. Dampen your hair with some hair spray or hair gloss and leave it overnight, and you will see that you woke up with some gorgeous hair curls. And you can always turn your hair to one side. This hairstyle works well for everyone, no matter the type of hair. If you have pin- straight hair, or if you have wavy hair, this hairstyle will always look good on you. You do not have to use any equipment for this hairstyle. Just let your hair dry at its own pace and you are ready for that evening party. This hairstyle has been in trend a lot amongst our celebrities this year. Are you willing to join the crowd? All you got to do is cut your locks into a sleek, bob look and style it accordingly. Also, if you have shoulder length hair, you can always try this look. When you think of beach waves, what comes to your mind is a curly headed girl. Getting those perfect curls is the combination of a good quality shampoo, conditioner followed by a curler to keep your locks in perfect place and shape. This look is simply gorgeous. One cannot refrain themselves from trying this look on their holiday. This look allows you to choose the kind of waves you are looking for in your hairstyle. If you are looking to create some big waves, blow out your hair clean. This will give your hair an excellent texture. Get a large curling iron and start taking up sections one by one. You will have to take each section carefully, one section has to be taken towards the face and the other one has to be taken away from the face. In case you want to increase the volume of your hair, you can always opt for hair extensions. If your hair is dyed in two different colors, or even more than two colors, then you should for sure go for this look. This is because creating such messy waves to highlight those colors that you have used to dye your hair and your hair will look more shiny and bouncy. If you want to find out how the beach waves look in their natural, all you have to do is not use any equipment or any hair product. It is important for you to understand your hair before you try out this look. If your hair cannot hold a curl completely, then this look won’t do justice to your look. If you have slightly textured hair, then you can easily create beach waves with the help of a curler and finish it up with the help of a spray. Doing this will make sure that the look that is created looks soft on you. If your hair does not hold a curl completely, or if you are not sure about getting that texture that you have been eyeing for, then you should surely consider our advice. You can always get that look with the help of a straightener. Yes, that is right, a straightener will help you in getting that look. This is because with the help of a straightener, your hair will get those twists that you had always wanted which will surely go with the hairstyle. Use the straightener while you are parting the hair and also while you are bending the different sections of your hair. Hair, today with bobs, have a lot of texture in them. Do you want to know how you can create that beachy wave when you have such short length hair? You must be wondering how girls with bob get this look by seeing pictures on Pinterest. Start by parting your hair into different layers; this has to be done horizontally. Now start curling your strands ear to ear. Now twist your hair with the help of flat iron in different directions, do not bother to remove the curls, leave it as it is. This will give that messy look that you have been always wanting to get. To make sure that those twists remain intact, you will have to use a texturizing cream to keep the look. If your hair is naturally curly, then what is the harm in going to natural beachy curls? The most important thing to keep into consideration is that your curls have to be soft and not stiff when being touched. If your hair is curly, then avoid going for salt sprays. This is because salt sprays tend to dry the hair. Instead of using a salt spray, you should use a product that is specifically meant for your curls. You can either use a hair mousse or a curl enhancer; once you have used this, you can finish by using a diffuser. A diffuser will give some more volume to your hair. If your hair is naturally straight and you are done curling them every single day, then you surely need a variant, and the name of this variant is perming. Well, to get this look, you will have to make some more efforts as this look cannot be achieved by just sitting at home and using some equipment and hair products. You will have to book an appointment with a salon as the person in the salon will be using some large rods, and they will also apply a solution known as the perm solution. Trust me, the result will be absolutely stunning, but make sure that you ask for additional treatment also so that your hair is saved from the damage. Are you interested in trying out different heatless waves? But before you do that, you should find out which one will work best for you based on the length of your hair and also on your hair type. If you have short hair, beach wave can be easily created with the help of elegance. Try and plait two to three loose braids, and when you do this, all your hair has to be a part of this. Leave it for some time and when you undo the braid, get some salt spray and spray it on your hair to get that braided look. This look works best if you have long hair. This is natural and very easy to try out. If you also want the top of your hair heavy and not just the middle part and the last part, this hairstyle will help you achieve that look. You can create this hairstyle without the help of heat. To get those perfect waves, this long waves will do the trick for you. If you are at home and have enough time till evening, create that long beach waves once your hair is dry and leave it like this for the rest of the day, once you open your hair the same evening or even the next day, you will surely see those braid waves. Do you know that beach waves are your go-to style for any hair texture? And in some cases, this proves out to be that one magical hairstyle that makes every girl look beautiful. This hairstyle also saves your hair from using various hot products. To get this look, you need to use a leave-in conditioner spray when your hair is dry, and for the end of your hair, you can use any of your favorite oil. After this, create a French twist, keep it for a few hours and then untwist the same. These are some of the fantastic and exciting beach waves hairstyles which you can easily create at home to get a compelling look and be ready to hit the beach in no time. It’s very important for all of us to keep our appearance look stylish and well groomed especially with outfits and haircuts. So here we are to provide you brief ideas about one of the major aspects of our look, and that is a haircut. 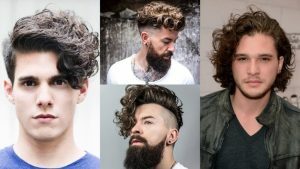 Haircuts are something that will give us perfect look and it enhances our face to look more beautiful, so all the people out there grab more stylish and hottest haircut inspirations from our site.